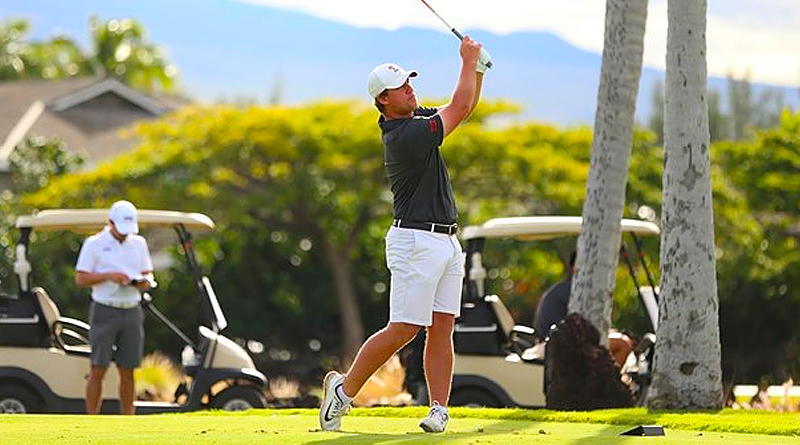 WAIKOLOA, Hawaii – Oklahoma State’s men’s golf team opened play on Thursday at the Amer Ari Invitational, firing a 21-under-par total of 267 to stand alone at the top of the leaderboard at Waikoloa Kings’ Course. The top-ranked Cowboys finished the day two shots clear of Texas Tech and bettered Oregon by four strokes at the par-72, 7,074-yard layout. Senior Zach Bauchou led the way with a career-best round of 63, which was one stroke shy of matching the low round in program history and tied him for the fifth-best score ever posted by a Cowboy. He will enter tomorrow’s second round two strokes clear of the field after posting an outward nine of 29. In addition to birdies at Nos. 2, 5, 7, 8 and 9, he carded an eagle at the fourth for a 7-under front side. His bogey-free inward nine included birdies at the 11th and 17th. Among those he matched in the Cowboy record books are current PGA Tour standouts Rickie Fowler, Alex Norén and Charles Howell. Junior Viktor Hovland also turned in a clean card that featured six birdies for a round of 66, tying him for third place. Coming off a tie for 50th place at the PGA Tour’s Waste Management Phoenix Open last weekend, sophomore Matthew Wolff posted a 3-under 69 to finish among the group tied for 20th place. Classmate Austin Eckroat also posted a 69 as did junior Ferdinand Müller, who is competing individually. Senior Hayden Wood finished the day tied for 65th after turning in a 73. The second round of action will get underway tomorrow at 7:30 a.m. (HST). The Cowboys will be grouped with Texas Tech, Oregon and Georgia Tech. Live scoring for the event is available at golfstat.com.